When you’ve got Batman, Superman, and Wonder Woman taking center stage in a major motion picture, brains are great and all but they will still need someone to punch. Enter Doomsday. The new trailer for Batman V Superman: Dawn of Justice has finally dropped, and gave us our first glorious look at the beast that killed the Man of Steel. Check out that image below and geek out, because lord knows we already have. Doomsday’s presence in Batman V Superman had long been rumored, but now we have official confirmation that the beastly Kryptonian monster will indeed make a violent debut appearance in the film. From what we can glean from the trailer itself, it appears that Lexcorp has gotten their hands on the body of General Zod, and uses his remains to develop Doomsday as a sort of anti-Superman. Just prior to his appearance, some sort of biomechanical machinery goes wild with thunder and lightning bursting all around; we cannot confirm the machinery’s nature just yet but it appears to be some sort of reverse engineered version of the Genesis Chamber from Man of Steel – the birth pods from which Kryptonians are born. As Luthor unveils him to our heroes, he refers to the monster as "the Devil" with a quivering, almost fearful voice that marks an intense departure from the gleefully cocky megalomaniac we see in every other appearance throughout the trailer. Doomsday’s sheer menace instantly signals that he’s not a being to be trifled with, definitely selling the idea that our heroes will need to band together in order to defeat this greater foe. 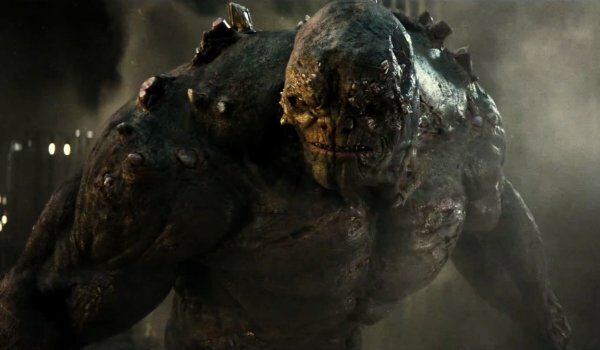 Much like his comic book counterpart, the Batman V Superman iteration of Doomsday has a bulky, grey physique with boney protrusions extending from various areas of his body. However, this version of the monster seems much more flesh than bone, making us wonder if this is the actual body of Zod turned into a monster, rather than something original created from his genetic makeup. Beyond just brute strength, this version of Doomsday has also been confirmed as having Kryptonian heat vision, which means that the beams we have seen Batman evading in the last two trailers likely don’t actually originate from Kal-El himself. While it seems unlikely that the battle between Superman and Doomsday will lead to Clark Kent's death in this film (as it did in the iconic 1990s comic book arc) don't rule anything out just yet. We likely learn more about the cinematic version of Doomsday as Zack Snyder's superhero showdown inches closer and closer to its release. Batman V Superman: Dawn of Justice will blast its way into theaters on March 25, 2016.